The Addison Singers’ autumn concert unusually features the music of one composer – Franz Josef Haydn. 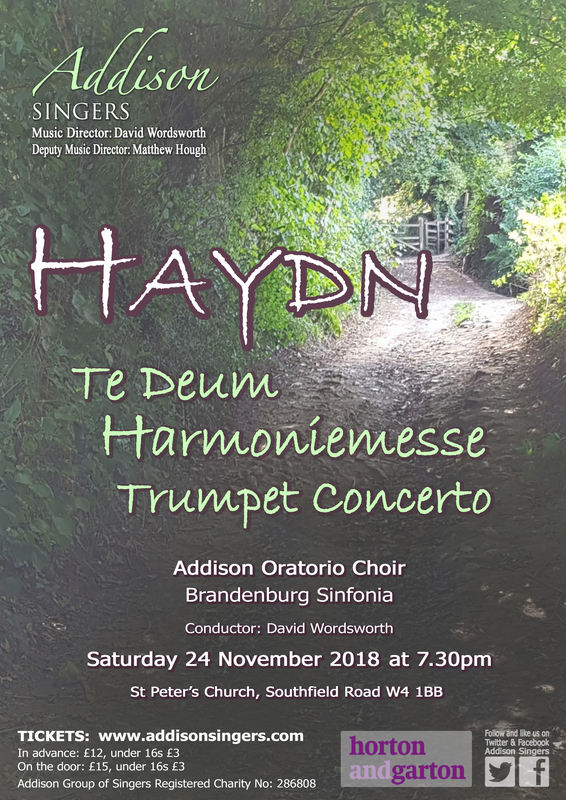 Few composers can stand such intense exposure, but such is the breadth of Haydn’s genius, the vivid imagination and melodic invention, not least in his sacred music, this promises to be a memorable evening. We begin with the celebratory ‘Te Deum in C’, written at the request of Empress Maria Theresa; a tuneful, vigorous hymn of praise, accompanied by trumpet and drums. The ‘Harmoniemesse’ is Haydn’s last major work – the nickname came long after the piece’s composition and comes from the fact that the score includes important parts for wind instruments; in Haydn’s time a wind-band was known as a Harmony Band. The sheer joy of Haydn’s response to the text of the Mass gives us on the one hand music of unrestrained joy and on the other music that verges on the eccentric, including a quirky setting of the Benedictus that has to be heard to be believed! In between these two great works, the celebrated trumpeter Paul Archibald joins the Brandenburg Sinfonia for a performance of the uplifting Trumpet Concerto, one of the first pieces of its kind written for the then, modern trumpet. The work’s three movements explore the capabilities of the instrument and the virtuosity of the soloist – a fitting celebration of one of the greatest but still perhaps neglected composers. Tickets in advance £12, under 16’s £3 (+ WGT booking fee), or £15 / £3 on the door.